Microsoft today updated Bing with a number of new features and refinements to help you navigate from point A to point B. The search engine will now show your estimated travel time, mileage and a small thumbnail of a suggested route whenever you search for driving directions. So whether it’s “directions from New York City to Boston” or “from Bellevue, WA to Tacoma, WA,” Bing will offer some context about your journey. 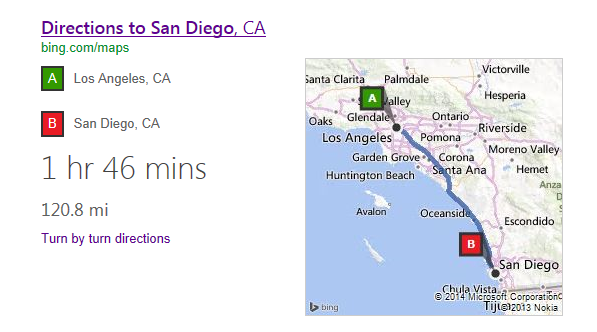 When you select the map thumbnail or “turn-by-turn directions” link, Bing will serve up a detailed plan of your route with a full breakdown of the directions. The feature is only available in the US at the moment, but Microsoft says it’s also enabled these new features on the mobile Web version of its search engine for devices running Windows Phone 8, iPhone and Android. Google has offered a similar service for some time, but it’s promising to see that Microsoft is targeting feature parity with its own search services. If Bing can stay competitive with Google, it stands a greater chance of attracting new users.